Dill is excellent in sauces, soups and salads. A chef's favourite with fish. 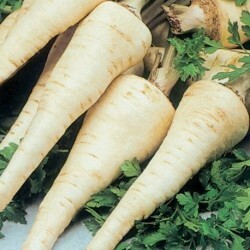 Grows up to 1.2 metres tall. 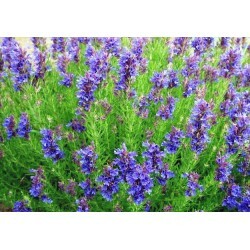 Sow this herb in pots, containers from mid Spring onwards. Cover these herb seeds with finely sieved compost. Dill can be sown direct outdoors too from late June till August. A tall, leggy, plant, best associated with it's partnering with pickles, dill is simple and rewarding to grow. 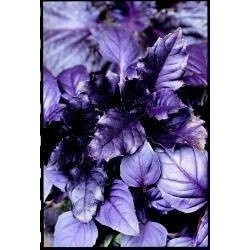 It has many culinary applications and is also valued by florists as a filler in flower arrangements. The big, wide, sprays of yellow flowers are quite pretty. Dill is a member of the carrot family and can grow up to 3 feet tall. 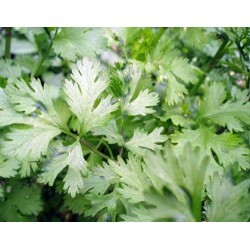 The stems, leaves, flowers and seeds are all edible, making this a great addition to an herb garden. It is widely used in many cultures, for medicinal and culinary purposes. Dill can be added to soups, salads, meat dishes, sauces, pickles, brewed as a tea or eaten plain and freshly picked from the garden. Dill needs at least 6-8 hours of sun a day. Try to find a protected spot where it won't be affected by high winds. The thin, feathery stalks can easily be blown over. Dill seeds should be sown directly in the garden. Dill is a strongly scented herb, and as many other herb seeds, the dill seeds have a great use in the kitchen too not just the foliage and the flowers. Dill does not transplant very well as it's root system is very shallow. After the last danger of frost has passed, it is safe to plant the seeds. Sow in rows 1/4” deep and 2 feet apart. Dill seeds are teeny tiny so it is almost impossible to plant individual seeds. Once the seedlings have reached 2” high, thin them to 10-12 inches apart. Alternately, dill can be grown in pots on the windowsill or as part of a container garden as long as these are the permanent locations for the plant. If doing either of these things, make sure the dill plant gets enough sun wherever it is – 6-8 hours preferably. The containers need to be fairly deep and have holes in the bottom so the soil is well drained. You may need to stake the plants as they will be leggier and spindly because of lower light levels indoors. To get a continuous harvest of dill, plant seeds every 2-4 weeks, throughout the growing season. Dill doesn't require a lot of water. Twice a week, once the seedlings have established, is good. Keep your dill carefully weeded. This can be tricky when they are little. Dill has a shallow root system which makes it easy to pull up when you are trying to remove the weeds. It is important to keep the dill weed free however as weeds will compete for nutrients and can cause a poor harvest. These tall plants may need to be staked in the garden if they are getting so big that they are bending over. 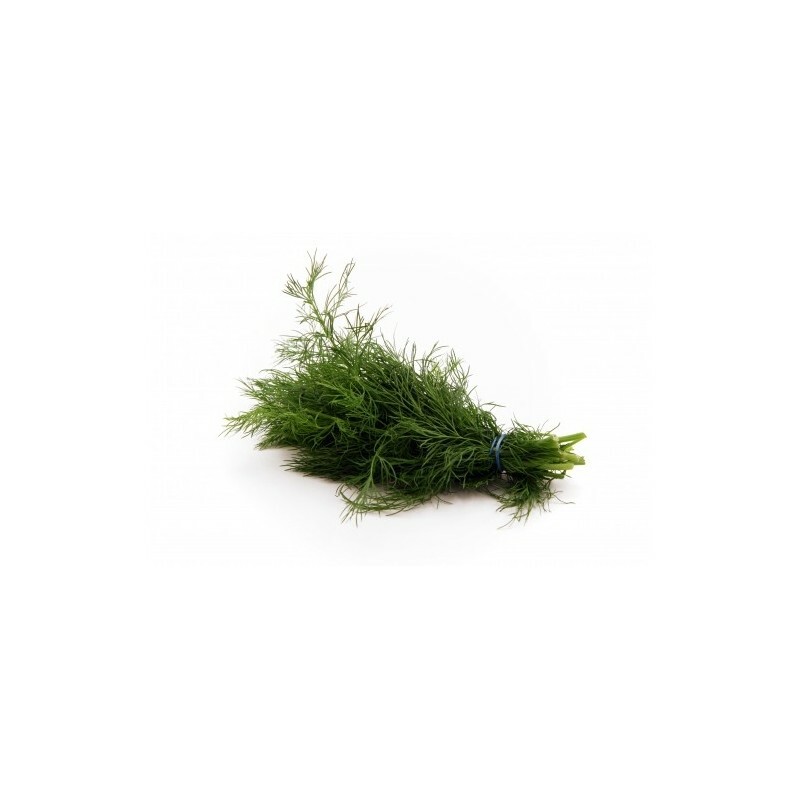 Dill foliage, the green leafy feathery parts, can be harvested anytime. Cut off the leaves right at the main stem. Or, cut the whole stem a couple inches off the ground and pull the leaves off, discarding the tough, thick stem. Cutting the leaves on a regular basis will delay flowering and keep the plants producing. It should be used as soon as possible after being picked as it loses it's flavor rather quickly. It can be kept refrigerated for up to three weeks however the longer the time, the milder the flavor will be. When the wide flower clusters start to open, the dill flavor is at it's best. To dry dill, hang the plant upside down in a place that is warm and doesn't get direct sun. The dried version of dill is not as strong as fresh. Dill can also be frozen in freezer bags. Dill seeds can be harvested as well. The seeds have a stronger, more penetrating, flavor than the leaves. When the flowers are mature, about 2-3 weeks after they emerge, they are ready. The stalks should be hung upside down in a place that is well-ventilated and not in direct sun. Fasten a small paper bag around the flower heads, poking a few holes in for air circulation. When the seeds mature, they will fall into the bag. These can be stored up to a year in an air-tight container away from bright light and heat. Any plants left in the garden will reseed readily so be prepared for more dill plants next year unless you've carefully harvested every flower head.